Has the Motor Vehicle Commission sent you a suspension notice? You can fight it! The New Jersey Motor Vehicle Commission (MVC) follows specific procedures when it proposes suspending a driver's license. These procedures are spelled out in the New Jersey Administrative Code, beginning at N.J.A.C. 13:19-1.1.This page outlines those procedures. The procedures apply to all New Jersey proposed driver's license suspensions except for cases involving fatal accidents and, in some situations, motor vehicle accidents involving serious bodily injury. We discuss those exceptions on our Fatal Accidents page. 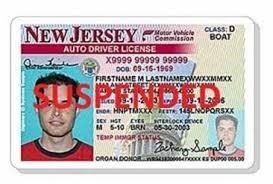 When the New Jersey MVC proposes to suspend someone's driver's license, it mails a Scheduled Suspension Notice to the driver at the address that the MVC has on file for that driver. The Scheduled Suspension Notice advises that, unless certain steps are taken, the driver's license suspension will go into effect on a specific date. In order to prevent the New Jersey driver's license suspension from happening, the driver must mail a letter to the MVC requesting a hearing. The letter must be provided within the time specified on the Notice. That time is often twenty-five days from the date of the notice. However, drivers must never assume that they have twenty-five days. It is crucial to read the Notice carefully in order to determine the actual deadline. The letter requesting the hearing must specify material facts or legal issues that the driver intends to raise at the hearing. If the letter raises legal issues, it must also include arguments in support of those legal issues. Unless the letter recites specific contested facts or legal issues (or both), no hearing will be provided. The MVC will then notify the driver that it is denying the hearing request, and will advise the date the driver's license suspension will take effect. When a hearing request contains disputed material facts, the New Jersey MVC will schedule a prehearing conference. It will notify the driver of the date, time, and place of the prehearing conference. The prehearing conference will be conducted by an MVC employee. The MVC refers to that employee as a “driver improvement analyst.” The driver is required to attend that conference. If the driver fails to attend the prehearing conference, the MVC considers the request for the prehearing conference to be abandoned. It will then issue the Notice of Suspension of driving privileges in New Jersey. When the sole reason for requesting the hearing is legal issues, with supporting arguments, the New Jersey MVC has three options. First, it can decide those issues without a hearing, and issue a written decision. Second, the MVC can schedule a prehearing conference, just as when the letter lists only contested facts. Its final option is to refer the matter to the New Jersey Office of Administrative Law (“OAL”) for a hearing in front of an administrative law judge. The prehearing conference has several purposes. These purposes include clarifying disputed material facts and legal issues raised in the hearing request; reviewing the evidence upon which the driver bases his or her claim; determining discovery needs of the driver; providing the driver with any discovery to which the driver may be entitled, and exploring the possibility of an agreement to resolve the administrative action to be taken. If a driver accepts the resolution of the proposed administrative action, the matter concludes. When agreement cannot be reached and legal or factual issues still exist, the matter is forwarded to the Office of Administrative Law for a hearing. Where no legal or factual issues remain, however, the matter is not sent to the Office of Administrative law. Rather, the New Jersey Motor Vehicle Commission notifies the driver that the proposed license suspension will begin on a specified date. The driver's only options at that point are to accept the suspension or to file a judicial appeal. This appeal would be filed in the Appellate Division of the Superior Court of New Jersey. Some situations exist where MVC can suspend driving privileges without a prior hearing. When that occurs, the suspension is valid, but MVC must then promptly provide a hearing. The Fatalities page on this site discusses those situations. Also, if the suspension is one that New Jersey law requires, and where MVC has no discretion, the procedures indicated above will not be followed. If this page gives you the feeling that the New Jersey prehearing conference is a hugely important step in the proceedings, you are right. Preparation for the conference is vital. The driver must know what to say at this prehearing conference. And, most importantly, the driver must know what not to say. This page does not, and cannot, provide that information. A skilled and experienced New Jersey lawyer will often be crucial in obtaining the best possible results. Lawyers (or, at least, good lawyers) are costly. When your New Jersey driver's license is on the line, not having a good lawyer fighting for you can be much more costly. Lawyers in the Law Offices of Allan Marain have the skills and experience needed to negotiate this territory. These lawyers are available to assist you on these incredibly important matters. You owe it to yourself to call them. All rights reserved. Page last updated October 04, 2018, and displayed Monday 22 April 2019, at 16:02:02 MDT.